The 32.1 metre motor yacht Stella Maris, listed for sale by Bob Cury at RJC Yacht Sales, has been sold with the buyer introduced by Carlos Dominguez at Denison Yachting. Originally named Fantasy, she was built in aluminium by US yard Broward in 1993 and refitted in 2004 and 2008. Her interior by Robert M Farinacci features white oak panelling throughout, accommodating 10 guests in five cabins comprising a main deck master suite, three doubles with queen size beds and a twin. All guest cabins have entertainment centres and en suite bathroom facilities while a further three cabins sleep up to six crewmembers. The main saloon boasts leather upholstered overhead panels and bulkheads, and offers comfortable seating on a U-shaped sectional settee in front of a glass-topped coffee table, three swivel chairs and two ottomans. There is also a wet bar, fridge and ice maker, while port and starboard cabinets store glassware, china and cutlery. Forward is a marble-floored dining area with seating for 10 guests. Al fresco dining is available on the aft deck at a teak table and loose chairs, while up on the flybridge is a helm station to port, built in upholstered seating, tables, sun loungers and a full wet bar. 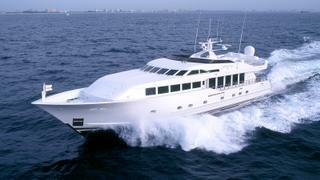 Twin 1,450hp Detroit Diesel engines allow a cruising speed of 17 knots topping out at 21 knots. Stella Maris was asking $995,000.